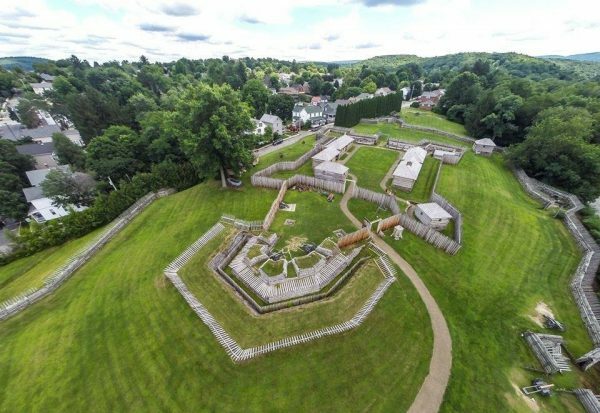 The history of Fort Ligonier in Pennsylvania began in September 1758 and was concluded in March 1766, embracing the period of the French and Indian War and Pontiac’s War. Today, the story of this time period is told through the remarkable Fort Ligonier museum exhibits and a fully reconstructed and restored fortification. A battle reenactment is held during the Fort Ligonier Days festival the second weekend in October. In the middle of the eighteenth century, two European powers, Great Britain and France, contested ownership of the vast inner basin of North America. The resulting conflict became known in America as the French and Indian War, which developed into a global struggle for empire later called the Seven Years’ War. A deliberate, careful march across hostile territory was advised, consolidating advances by building posts and supply depots. 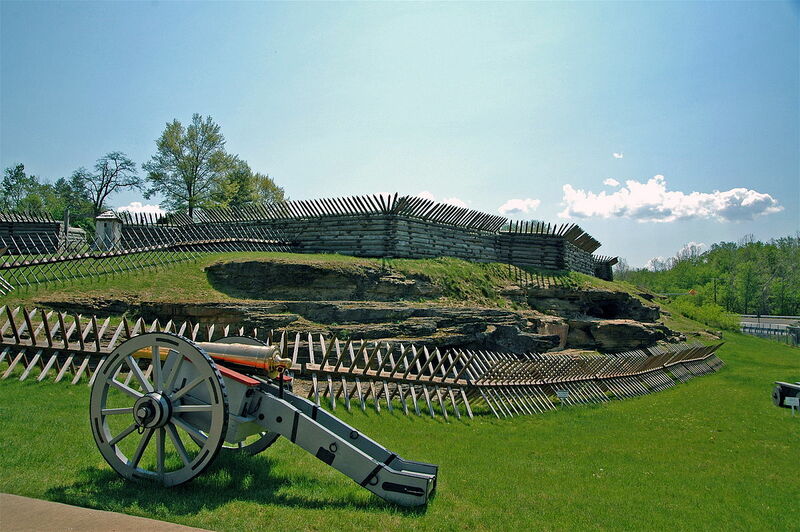 Fort Ligonier was the final post on the Forbes Road and the staging area in southwestern Pennsylvania to attack Fort Duquesne. By 1758, General John Forbes was assigned the daunting task of seizing Fort Duquesne, the French citadel at the forks. He ordered construction of a new road across Pennsylvania, guarded by a chain of fortifications, the final link being the “Post at Loyalhanna”, fifty miles from his objective, to serve as a supply depot and staging area for a British-American army of 5000 troops. The fort was constructed in September 1758. By late October, Washington had arrived at Loyalhanna, but not before the defeat of a British force at Fort Duquesne on September 14, and the successful defense of Loyalhanna from a French attack on October 12. Heavily outnumbered, the French abandoned Fort Duquesne, which Forbes occupied on November 25. He designated the site “Pittsburgh” in honor of Secretary of State William Pitt. Forbes also named Loyalhanna “Fort Ligonier” after his superior, Sir John Ligonier, commander in chief in Great Britain. During the eight years of its existence as a garrison, Fort Ligonier was never taken by an enemy. It served as a post of passage to the new Fort Pitt, and during Pontiac’s War of 1763. It was a vital link in the British communication and supply lines. It was attacked twice and besieged by the Native Americans, prior to the decisive victory at Bushy Run in August of that year. In March 1766, Arthur St. Clair was appointed civil caretaker, and Fort Ligonier was decommissioned from active service. Several distinct types of armed fighting men served the British Crown during the French and Indian War and were present at Fort Ligonier. The King’s regulars were raised in the British Isles and paid by the Crown, although colonists also enlisted in the regular army. At Fort Ligonier, 1758-1766, British army regulars included the 60th Regiment of Foot (Royal Americans), the First Highland Battalion (Montgomery’s Highlanders) or the 77th Regiment of Foot, a Royal Artillery detachment, the 94th Regiment of Foot (Royal Welsh Volunteers) and the 42nd Royal Highland Regiment of Foot (Black Watch). Provincial troops consisted of volunteers recruited, equipped and paid by individual colonies. At Fort Ligonier, these troops were from Pennsylvania and Virginia, with detachments from the “Lower Counties” (now Delaware), Maryland and North Carolina. Local militia served at the fort in 1763. Officers were entitled to extra rations to provide for guests and, for field officers, aids and staff. Young men purchased commissions in the British army, and promotion required seniority, merit, additional purchases and, often, a friend in power. Colonels of standing regiments were appointed by the King. Officers could receive special rank during service abroad. Forbes was commissioned a brigadier general “in America only”. Aside from the festival days, the historic site and museum are open daily from April 29 – November 19. Museum and museum store open weekends (Friday, Saturday and Sunday) year-round. The Outdoor historic site area is closed November 20, 2017 – March 15, 2018. Hours of operation are 9:30am – 5:00pm Monday through Saturday and 11 am – 5:00pm on Sundays. During summer hours closing is at 7:00pm on Thursday and Friday. You will want to allow at least an hour to tour the outside grounds, not counting time spent in the museum and museum store. During your visit, you will want to explore the impressive Fort, museum galleries, world-class exhibits, and extensive archaeological collections. CLOSED: Thanksgiving Day, December 22 – 25, and December 31. Fort Ligonier is available for school tours from April 1 through November 1. April, May and September are the busiest months. Advance Reservations are required. Reserve your group experience by calling: 724-238-9701 or emailing the Education Department at: [email protected]. Eight acres of the original site of Fort Ligonier have been preserved, with the subsurface features restored and the above-ground elements reconstructed on a commanding hilltop in the beautiful Laurel Highlands. The inner fort is 200 feet square, defended by four bastions and accessed by three gates. Inside is the officers’ mess, barracks, quartermaster, guardroom, underground magazine, commissary, and officers’ quarters. Immediately outside the fort is General Forbes’s hut. An outer retrenchment, 1,600 feet long, surrounds the fort. Other external buildings include the Pennsylvania hospital (two wards and a surgeon’s hut), a smokehouse, a saw mill, bake ovens, a log dwelling and a forge. Visit Fort Ligonier during Fort Ligonier Days to view the impressive commemoration of the Battle of Fort Ligonier, a key engagement of the French and Indian War, fought on October 12, 1758. You will see dramatic artillery demonstrations, watch the battle reenactments twice a day on Saturday and Sunday, and listen to riveting narration of the events. Visitors will enjoy a multi-sensory experience throughout the fort. See colorful flags, uniforms, and daily camp life. Hear the musket fire, cannon fire, and military music. Smell the wood smoke from the reenactors campfires and gunpowder from the artillery demonstrations and battle reenactments. Visitors can interact with costumed interpreters who represent the different perspectives of the French and Indian War (1754-1763) – British, French, and American Indians. PARKING: Parking is not available at Fort Ligonier during Fort Ligonier Days. Please follow signs to the official parking areas ($10.00 parking fee per vehicle per day). 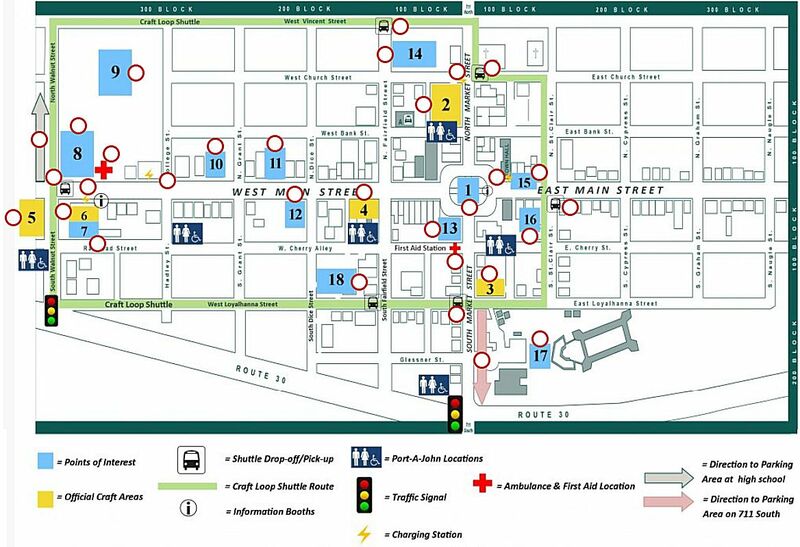 Shuttle buses are available from the parking lots to town. Fort Ligonier is located within one block of the Diamond and adjacent to the Loyalhanna Craft Lot. Parking is available at the Ligonier Valley High School, Holy Trinity Catholic Church, and St. James Lutheran Church has limited parking, including handicap, available. There is also Parking on Route 711 South at Laurel Valley Golf Club, located at 175 Palmer Drive. 6:30 PM – A Kid’s Costume Competition is a Fort Ligonier Days tradition. Contest is open to all students from Kindergarten through 5th grade. Event will be held in the Fort Ligonier Center for History Education. Cash prizes are awarded and all contestants are invited to participate in the Fort Ligonier Days Parade. Call 724-238-9701 for criteria, guidelines and registration information. Pancake Breakfast at Heritage United Methodist Church. 9:00 AM Fort Ligonier and Museum Store Opens. 1:30 – 4:30 PM Music in the Wine Tasting area. 2:00 PM Troops begin arriving to set up camp for living history demonstrations and prepare for the weekend’s artillery demonstrations and battle re-enactments. 5:00 PM Fort Ligonier closes to the Public. 6:30 AM to 8:45 AM Music on the Smail Auto Group Stage. Encampment and living history demonstrations throughout the day. Meet officers and soldiers and learn about 18th century life in a frontier fort. Characters include General John Forbes, commander of the British Army, and Cherokee Chief Attakullakulla. 11:00 AM The Fort Ligonier Days Parade is a must-see experience of the three-day event. The parade steps off Saturday morning at 11:00 AM sharp and winds down Main Street (East to West). The two-hour parade features historic units, horses, college and high school bands, floats, Shrine units, and more. Smail Auto Group Stage is the location of the parade reviewing stand and the parade MC. 1:30 to 3:30 PM Artillery demonstrations. 2:00 PM and 4:00 PM Battle reenactment of the 1758 Battle of Fort Ligonier. 8:30 AM Fort Ligonier Days 5K Walk/Run route starts at Ligonier Valley High School on Springer Road and traverses Main Street in both directions. Runners and Walkers will race through the festival area — including around the historic Ligonier Diamond. Awards for top 3 male and female runners overall, top 3 male and female walker overall, and to the youngest and oldest finisher. Encampment and living history demonstrations throughout the day. Meet officers and soldiers and learn about 18th century life in a frontier fort. 10:00 AM Divine Services in the Upper Fort area. 1:00 – 4:00 PM Music in the Wine Tasting area. 1:00 PM and 3:00 PM Artillery demonstrations. 1:00 and 3:30 PM Battle reinactment of the 1758 Battle of Fort Ligonier. 4:30 PM Fort Ligonier closes. Area: 1 – The Diamond Area. More than 30 food booths, live entertainment on the Bandstand, and an information booth located on the East side of the Diamond. Area 2 – Municipal Craft Lot. Official Craft Area. Port-A-Johns can be found adjacent to the craft area, behind the Ligonier Valley Library. Area 3 – Loyalhanna Lot – Official Craft Area. Area 4 – Fairfield Lot – Official Craft Area. Area 5 – Mellon Park – Official Craft Area. Area 6 – Train Station East Lot. Official Craft Lot. LVSD Administration lawn – Information and snack booths located here as well as handicap and other port-a-johns. Area 7 – Train Station West Lot. LVSD Administration lawn – Official Craft Areas. Area: 8 – West Main & Walnut Streets is site of Fort Allen Antique Farm Equipment. Area: 11 – Pioneer Presbyterian Church will have food and beverages available. Area: 12 – Wine Tasting Event on the Lawn of Thistledown at Seger House – ID Required. Must be 21 or over to sample or purchase wine. Handicap accessible port-a-johns located here. Area: 14 – Ligonier Valley YMCA. Nurture and Nook, Kids Korner and craft and food vendors are set up. Area: 16 – Mommy Gear is the location of a baby feeding and changing station. Area: 17 – Fort Ligonier is the site of the French and Indian War Battle of 1758. Artillery demonstrations and battle re-enactments planned for Saturday and Sunday afternoons. Area: 18 – Ramada of Ligonier. ID Required. Bud Light Tent featuring food and beverages will be open Friday and Saturday in the parking area behind the hotel. 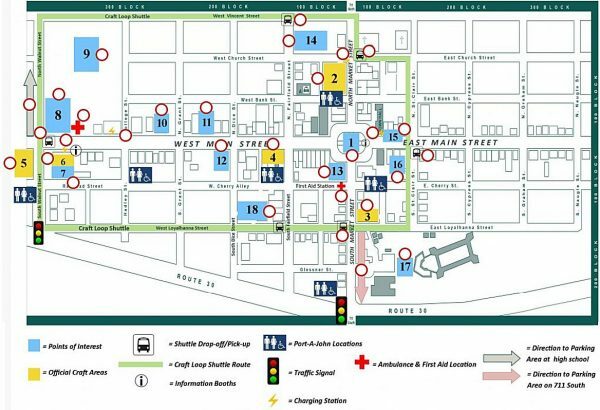 First Aid Station – Located in the basement of the Heritage United Methodist Church. Center sidewalk or close to the Information Booth. Crafters and artisans interested in participating in one of Fort Ligonier Days Official Craft Lots should contact the Ligonier Valley Chamber of Commerce at [email protected] or 724-238-4200.